The deadline for “Starparty’s Random Map Competition #3” has now ended and many more maps than expected were submitted this time, which of course is very fun. The fact that people believe that my competitions actually are worth spending time on is really flattering. The competition rules this time was to create a “superbalanced” 2 player map on desert or ice. The map also were supposed to be original, meaning that any map looking like my own (4)Arena would fail. The guidelines were quite clear to me (naturally) when I posted them, however they were interpreted quite differently, but since it brought out all kinds of different maps I felt there were no reason to explain the rules any more accurately until the competition was over. Which it is. - Dimensions were 96x128, 96 width and 128 height. That was also quite clear. - The maps were supposed to be original and balanced. Meaning that a map based on the generally recognized “8-8-6” concept as I just named it *cough* was not wanted this time. 8-8-6 standing for the amount of minerals in the first and second natural expansion and the term itself meaning a main base on a hill with a choke and an easy defendable expansion with a cliff. Some thought I meant that no high ground –at all- was allowed, which of course wasn’t the case. They managed to make good maps anyway though. I didn’t really notice too much who made what map, and when I took all the jpeg’s home (I have i-net at school) and looked at them, I had no names to connect them with, and I think that helped me a bit in making a unbiased decision. So what map won? Let’s see. This map qualifies for third place because of the literally interpretation of the rules it reflects. With incomprehensible potential and very many possibilities the map is a good example of what I wanted to achieve with this competition. The only drawbacks from reaching higher position are the obvious pathing problems and the difficult layout. Second place is taken by a desert map with a lot of potential. With several cliffs and harassing possibilities this map screams to be on the list and the detailed design doesn’t make it any worse. There you have it. The SP’s RMC#3 is over and many great maps were submitted. I will start the new competition RMC#4 as soon as possible and I hope it will be as popular as this one. We saw 13(+1) great maps in this competition and we can only hope to see many more as we go! 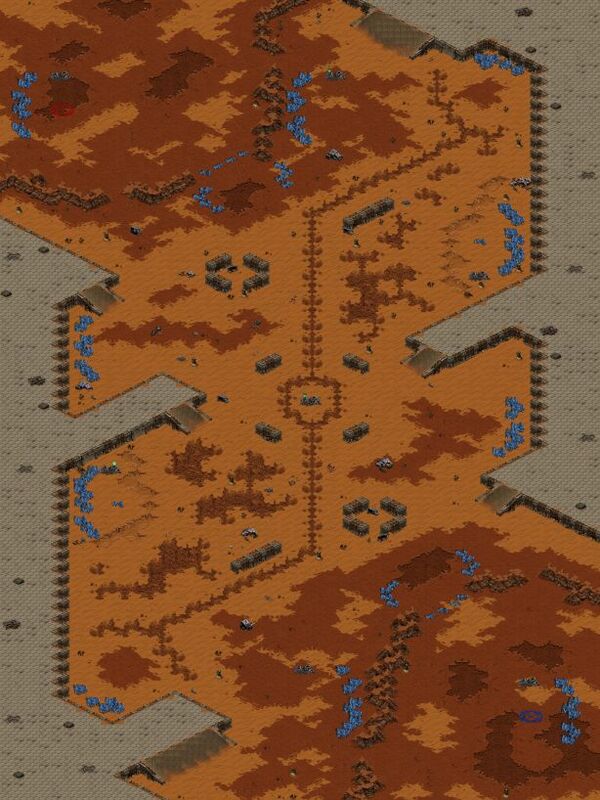 The winning map (2)Evisceration by flothefreak. What to do with our next Map of the Week? Time runs out, today is the last day to decide which map should be honoured and we're still not sure! Hey, but maybe some of you have an idea! Give your opinion, vote with your comment, explain why you want map XYZ to be the next MOTW! Where to vote? Bill307 made the final mappack for the blizzcon-mapcontest winning maps. I also want you to know I just wrote "the gas issue, part 2", you can find the article in our article-section. For all who still have the "old" version of scm2jpg: I uploaded the mapconverter, (<-Files) which is the same tool, just with small additions (mapsize minimap, normal, huge) and small changes in detail (correct mineralvalue displayed). It still has bug's so if you create a mineralblock with a value of 0, it`s not displayed. Well, just wanted you to keep you "up to date". The tool is quite old actually, but some of you don't seem to have a tool like that, so check it out. It's cold outside, the leaves are falling, the new Gosugamers.net and BWMN Tour Map-of-the-Week Mappack is delivered and played on heavily, replays for that maps are uploaded every several hours, everything seems just fine... everything? Not really... something is missing... something really important... our newest Map of the Week! A new mapper called Antares just showed up recently and surprised us with a basic but somehow beautiful map, and we decided his map (4)Scorpion Desert to be our new Map of the Week! This map almost tears you into the hot and sweaty desert with it's neverending sanddunes across the huge center. Once you've decided to leave your mainbase, you see yourself running through the golden dust of ages. The expansions are, even if they look very basic, very well positioned. While the gas natural cliff has a ramp, which makes it easier to defend against an enemy, the min-only has a real cliff in it's back, waiting for Tanks or Templars to drop. Be sure that you don't get mad in the heat of the sun, when you try to expand in the mapcenter, both min-onlys are hard to defend, but worth to take. Or you decide to expand on one of the islands, to secure the last gas and invite some Terrors to join you. The melee version download! Or do you prefer to enter some more comments? And don't forget to enter your sugguestions and comments for our Map of the Week 41! as you might have recognized, there were plenty of new maps uploaded the past days, and some of you might want to see what the comments on the recent maps looked like, so i wanted to remind you that you just have to click on Newest updates on the right hand side, to see the maps which were recently updated/commented on/replays added/GMCS infos posted or similar. Also i wanted to inform you about a tool that made our life easier for a long time now, especially the UMS mappers out there, but the melee mappers as well. SI made a small update to his wonderful Mapeditor, a TrigEdit plugin to be found on the SCMdraft homepage - www.stormcoast-fortress.net. Now, even setting triggers is easier and you don't have to use an extra tool or StarEdit for it anymore. Anyway, i also wanted to thank Suicidal Insanity for his almost everlasting project and his support for the mapping community in general. SI is always listening to our wishes and simply wants to create the best Starcraft Editor ever made, and he seems to be very successfull with that. Just uploaded some graphics with better/smother details.